So how do birds survive in a tropical rainforest when it rains a lot? Let me be clearer; when it rains nearly every day for 2 weeks straight? The rainy season here in Costa Rica lasts from May to November increasing in the amount of rainfall as the season progresses. October and November are notorious for being the wettest months of the year. Well, the pattern seems to be holding up this year as expected. Over the last few weeks the rain has let up very little and as it went on and on, I started to wonder; how do birds keep themselves fed with so much rain, and intense rain at that? Obviously when there are gaps in the rain the birds can take advantage to hunt or search for fruit, but when it rains hard for hours or days at a time the opportunity to feed becomes limited, fat reserves would likely decrease and stress levels increase. When birds are faced with seasonal rains many of them will migrate downhill where, as it turns out, there is less rain. It rains quite a bit more at higher elevations than it does at lower elevations and we have seen that pattern play out right here between the Piro Research Center located just above sea level, and the Greg Gund Conservation Center at Cerro Osa which sits at about 250 meters. The difference in elevation wouldn’t seem that dramatic, however in the month of October alone Piro received 74.9 cm (29.5 inches) of rain while Cerro Osa received 145 cm (57 inches). That is nearly double and impressive considering that Cerro Osa is only a mere 2 km uphill from Piro. Seasonal migrational movements are common in tropical bird species which roam the forest in search of food resources during the non-breeding season while temporary migrational movements may also be just as common place for those birds escaping inclement weather here in the tropical rainforest. Food resources are not generally more abundant at lower elevations but the feeding opportunities that less rain provide may offset that enough for birds to get through the rainy season. You can go to Friends of the Osa website for up-to-date weather data or to see maps of Piro Research Center and the Greg Gund Conservation Center and the connectivity between the two areas via our interactive trail maps. The Gray-headed Tanager (Eucometis penicillata) photograph was taken here near Playa Piro between storms by Friends of the Osa’s Sea Turtle program coordinator Manual Sanchez as he was headed out to the beach for turtle beach patrol. Sitting under a large palm leaf is probably a good way to keep somewhat dry during a downpour. The Orange-collared Manakin (Manacus aurantiacus) comes from Gianfranco Gomez at the Drake Bay Rainforest Chalet. 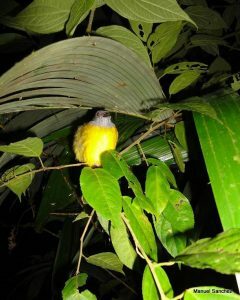 Both birds are common resident species found here on the Osa Peninsula and here at Friends of the Osa.